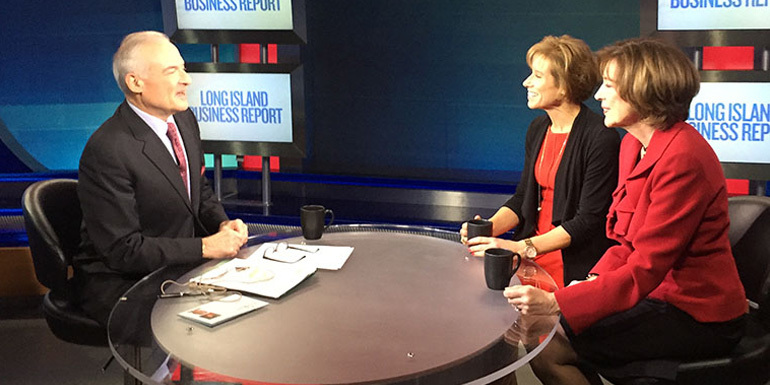 Austin & Williams’ President Eva LaMere suggested Long Island businesses looking to stand out in the crowded New York competitive environment take a closer look at today’s digital marketing technology, during a recent appearance on Long Island Business Report on WLIW21. “Digital marketing has leveled the playing field for smaller businesses,” explained Eva, who was interviewed by anchor Jim Paymar in an episode that first aired on April 27. “They can compete in the digital space. Before, when it was just television, print and radio, it was much more expensive to do so. Now, with efficiencies like geotargeting and cost-per-click, smaller businesses can compete and see business acquisition and growth.” The technology that’s had the biggest effect on our lives—and digital marketing? The mobile phone, hands-down, said Eva, who appeared alongside Katherine Heaviside, President of Epoch 5 Public Relations. From a business perspective, the biggest draw to digital marketing is its measurability, Eva noted. Driving—and continually measuring and optimizing such actions—is the focus of the team at Austin & Williams. According to Eva, the outcomes-driven agency, which specializes in financial services, healthcare and higher education, is continually investing in research, resources and employee training to ensure they remain on the leading edge of digital marketing and measurement.